Your child will walk when he has the right amount of balance, co-ordination, strength and confidence to do so and not before. You can provide things that will help him to balance. 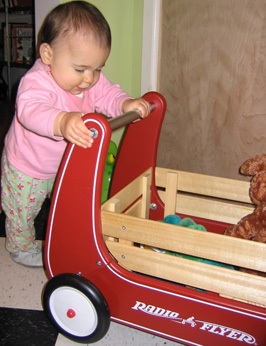 A walking wagon, which is weighted for pushing and not pulling provides enough stability for your child to support himself, begin pushing, and not fall flat on the ground with the wagon shooting out ahead of him. You can create the same resistance by weighting a wagon with something heavy like a bag of potatoes. 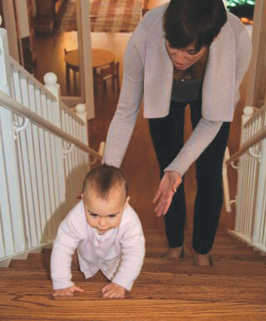 Find a place where he can practise climbing stairs safely. 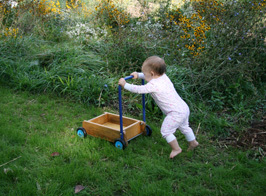 You may need to help your child negotiate his first explorations on foot. Let him do the parts he can do and show him how to do the things he has not yet mastered. For example, he will not have any problems climbing stairs but you will need to show him how to turn his body to come down and help him to extend his leg to the lower step. 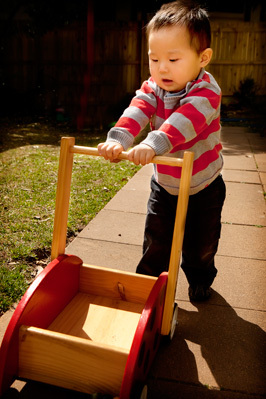 It takes time for your child to master all the movements he needs to become a steady walker. Be patient and allow him unlimited time to practise for himself and don’t be tempted to pull him up onto his feet and ‘make’ him walk.